No ISBN, Book-of-the-Month Club, 1990, 67pp. 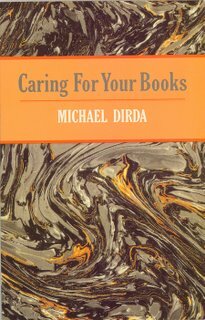 There are a plethora of books out there on caring for your books – mine included, then why should you scoff up a copy of this one? cause it’s fun. Not only does Dirda cover all the potential injurious things it laces them with anecdotal evidence . . . forget it, I can’t review a reviewer’s book, my writing is totally inadequate for the task. A book, it has been said, is a machine to think with. We scribble in the margins, underline sentences, argue with the author on the blank end papers, dog-ear favorite pages, mark our place with a pencil, splash soapy water on the dust jacket while reading in the bathtub, and when the author finally goes just too far, fling the maddening, useless volume onto the floor. Or worse. Rex Stout’s fictional detective Nero Wolfe once ripped the pages from Webster’s Third New International Dictionary and tossed them angrily into a blazing fire. Why? Because of the linguistic laxity of the new dictionary, which did not proscribe the use of words like ain’t and the misuse of hopefully. Not having access to a photocopying machine and being too lazy to transcribe favorite passages, the 19th-century writer Thomas De Quincey, best known for his Confessions of an English Opium Eater, would take reading notes by tearing out the pages that interested him. The poet Wordsworth used a greasy butter knife to cut open a volume of Burke. And in his old age the philosopher George Santayana would literally take a book apart to read it. After slicing off the covers, he would separate the text into its signatures; 16- or 32-page sections he would enjoy, usually while reclining in bed, and then when finished drop hem directly into a wastebasket. Did these people abuse their books? It’s hard to say. Each of them looked at the physical book and saw simply a container, a tin can holding the green beans of wisdom and poetry. What mattered was the intellectual nourishment inside. And yet a book can also be a thing of beauty, a joy forever. Early books were treated as sacred objects, as indeed they might be, since many of them were scripture. To honor them, artists illuminated their pages with pictures, gilding, and gorgeous initial capital letters. The vellum leaves were bound in elaborately tooled leathers, the covers fitted with clasps, inlaid with jewels. The Lindisfarne Gospels, The Book of Kells, The Very Rich Hours of Jean, Duc de Berry, the Giant Bible of Mainz, the Kelmscott Chaucer ­these are among the supreme works of art of their times. To damage them would be-no other word is appropriate – sacrilege. The attitude of modern readers to their books lies somewhere between these two extremes. We want to enjoy our books, but we’d also like to keep them around for a while. We plan to dip into old favorites again and again; we might like to pass others on to our children; and we may even hope that a few of our particular treasures will go up in value and earn a tidy sum when we, or our heirs, sell them to an antiquarian book dealer. A copy of Edgar Allan Poe’s rare first book, Tamerlane and Other Poems (1827), would bring at least $250,000 at auction, probably more. But even contemporary titles in fine condition can be surprisingly valuable. A first printing of Louise Erdrich’s acclaimed novel Love Medicine (1984) might cost a collector $200, with the price going up every day. After all, the book received the National Book Critics Circle Award for fiction, its print run was small, and Erdrich’s critical reputation has increased with each subsequent book. To keep a home library attractive and bright requires a little care and a lot of common sense. You don’t need to treat books like delicate Sevres vases, liable to self-destruct at the mere presence of a toddler, but neither should they be manhandled like the morn­ing newspaper. Take care of the books you have, and you will have books worth taking care of.